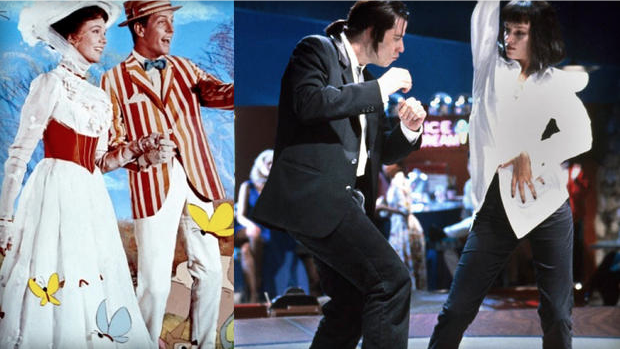 “Pulp Fiction,” “Mary Poppins” added to National Film Registry – CBS News. “The Library has named 25 films to be added to the National Film Registry, its collection of films deemed to be culturally, aesthetically or historically important. One of the most eclectic of film lists, its aim is to help protect our nation’s fragile film heritage. What a list of films to have made this year’s National Film Registry! Many of my favorites, in fact. Not only did it include the two above, but a grand mix across decades of cinema made it more than notable. Comprising The Right Stuff, The Magnificent Seven, Forbidden Planet, Gilda and others. No doubt one of my preferred authors, Ken Bruen, rejoiced (not) over The Quiet Man‘s new rarified status. I recommend wandering over to David Morgan’s piece and reading who else made the registry in 2013. It’s surprising that Pulp Fiction is only now being added. Probably took some time at the Registry to see how great it was. Thanks, my friend. Yay! Pulp Fiction and Poppins are two of my favorites. Glad to see they made the list. Got a real kick when they announced this year’s list for that. Thanks, Fernando. Right. Two wildly different movies, both great. Also a big fan of WAOVW? I just finished watching Mary Poppins for the first time since I was in grade school! The songs are still catchy as ever…me and the wife are going to see Saving Mr. Banks tomorrow.